IEEE Pervasive Computing, 16 (1), pp. 6–10, 2017. 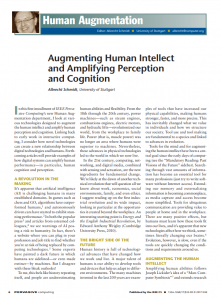 This first installment of the new Human Augmentation department looks at various technologies designed to augment the human intellect and amplify human perception and cognition. Linking back to early work in interactive computing, Albrecht Schmidt considers how novel technologies can create a new relationship between digital technologies and humans. Computer, 50 (10), pp. 102–106, 2017. 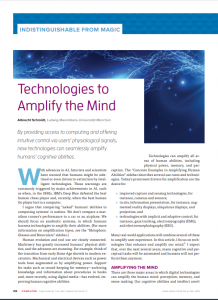 By providing access to computing and offering intuitive control via users' physiological signals, new technologies can seamlessly amplify humans' cognitive abilities. Proceedings of the ACM on Interactive, Mobile, Wearable and Ubiquitous Technologies, 1 (3), pp. 33, 2017. Current digital systems are largely blind to users’ cognitive states. Systems that adapt to users’ states show great potential for augmenting cognition and for creating novel user experiences. 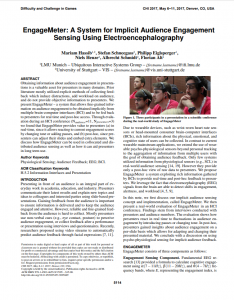 However, most approaches for sensing cognitive states, and cognitive load specifically, involve obtrusive technologies, such as physiological sensors attached to users’ bodies. 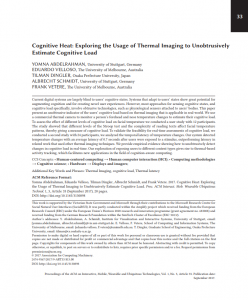 This paper present an unobtrusive indicator of the users’ cognitive load based on thermal imaging that is applicable in real-world. We use a commercial thermal camera to monitor a person’s forehead and nose temperature changes to estimate their cognitive load. To assess the effect of different levels of cognitive load on facial temperature we conducted a user study with 12 participants. The study showed that different levels of the Stroop test and the complexity of reading texts affect facial temperature patterns, thereby giving a measure of cognitive load. To validate the feasibility for real-time assessments of cognitive load, we conducted a second study with 24 participants, we analyzed the temporal latency of temperature changes. Our system detected temperature changes with an average latency of 0.7 seconds after users were exposed to a stimulus, outperforming latency in related work that used other thermal imaging techniques. We provide empirical evidence showing how to unobtrusively detect changes in cognitive load in real-time. Our exploration of exposing users to different content types gives rise to thermal-based activity tracking, which facilitates new applications in the field of cognition-aware computing. Proceedings of the ACM on Interactive, Mobile, Wearable and Ubiquitous Technologies, 1 (3), pp. 47, 2017. People’s alertness fluctuates across the day: at some times we are highly focused while at others we feel unable to concentrate. So far, extracting fluctuation patterns has been time and cost-intensive. Using an in-the-wild approach with 12 participants, we evaluated three cognitive tasks regarding their adequacy as a mobile and economical assessment tool of diurnal changes in mental performance. Participants completed the five-minute test battery on their smartphones multiple times a day for a period of 1-2 weeks. Our results show that people’s circadian rhythm can be obtained under unregulated non-laboratory conditions. Along with this validation study, we release our test battery as an open source library for future work towards cognition-aware systems as well as a tool for psychological and medical research. We discuss ways of integrating the toolkit and possibilities for implicitly measuring performance variations in common applications. 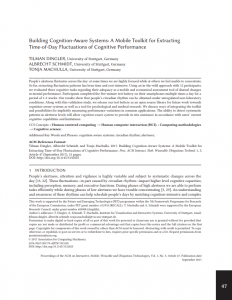 The ability to detect systematic patterns in alertness levels will allow cognition-aware systems to provide in-situ assistance in accordance with users’ current cognitive capabilities and limitations. Proceedings of the 16th International Conference on MUM. ACM, 2017. Most of the typical digital systems are not fully aware of the users' affect states. Adapting to the users' state showed great potential for enhancing user experiences. 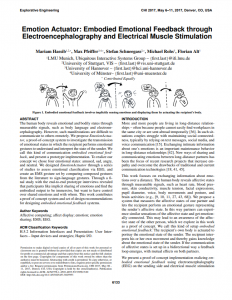 However, most approaches for sensing affective states, specifically arousal and valence, involve expensive and obtrusive technologies, such as physiological sensors attached to users' bodies. This paper present an indicator of the users' affect based on eye tracking. We use a commercial eye tracker to monitor the user's pupil size to estimate their arousal and valence in response to videos of different content. To assess the effect of different content (namely pleasant and unpleasant) influencing the arousal and valence on the pupil diameter, we conducted a user study with 25 participants. The study showed that different content of videos affect the pupil diameter, thereby giving an indicator about the user's state. We provide empirical evidence showing how to unobtrusively detect changes in users' state. Our initial investigation gives rise to eye-based user's tracking, which introduces the potential of new applications in the field of affect-aware computing. Proceedings of the 2017 ACM International Joint Conference on Pervasive and Ubiquitous Computing and Proceedings of the 2017 ACM International Symposium on Wearable Computers, pp. 1067–1071, ACM, Maui, Hawaii, 2017, ISBN: 978-1-4503-5190-4. Human's vision can only operate in the limited visible band of the electromagnetic spectrum. Using commercially available imaging sensors can be beneficial to extend human's visual perception in different environments. Typically, these environments include challenging conditions, for instance smoky views during a fire or occluded, foggy, cloudy and windy view in mountain environments. Recently, thermal imaging became more commercially available, which makes utilizing it to extend the human's visual perception affordable and deployable. 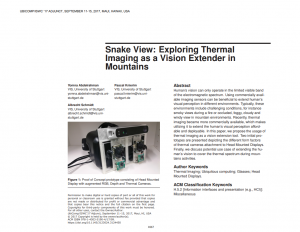 In this paper, we propose the usage of thermal imaging as a vision extension tool. Two initial prototypes are presented depicting the different form factors of thermal cameras attachment to Head Mounted Displays. Finally, we discuss potential use case of extending the human's vision to cover the thermal spectrum during mountains activities. Proceedings of the 2017 ACM International Joint Conference on Pervasive and Ubiquitous Computing and Proceedings of the 2017 ACM International Symposium on Wearable Computers, pp. 693–696, ACM, Maui, Hawaii, 2017, ISBN: 978-1-4503-5190-4. Our visual perception is limited to the abilities of our eyes, where we only perceive visible light. This limitation might influence how we perceive and react to our surroundings, however, this limitation might endanger us in certain scenarios e.g. firefighting. 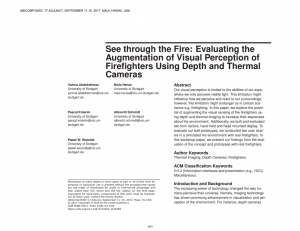 In this paper, we explore the potential of augmenting the visual sensing of the firefighters using depth and thermal imaging to increase their awareness about the environment. Additionally, we built and evaluated two form factors, hand held and head mounted display. To evaluate our built prototypes, we conducted two user studies in a simulated fire environment with real firefighters. In this workshop paper, we present our findings from the evaluation of the concept and prototypes with real firefighters. Proceedings of the 19th International Conference on Human-Computer Interaction with Mobile Devices and Services, pp. 89:1–89:8, ACM, Vienna, Austria, 2017, ISBN: 978-1-4503-5075-4. Smartphones, wearables, and other mobile devices often use tactile feedback for notifying users. This feedback type proved to be beneficial since it does not occupy the visual or auditory channel. However, it still can be distracting in other situations such as when users are already stressed. 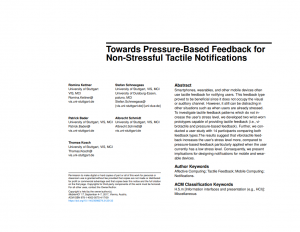 To investigate tactile feedback patterns which do not increase the user's stress level, we developed two wrist-worn prototypes capable of providing tactile feedback (i.e., vibrotactile and pressure-based feedback). Further, we conducted a user-study with 14 participants comparing both feedback types. The results suggest that vibrotactile feedback increases the user's stress level more, compared to pressure-based feedback particularly applied when the user currently has a low stress level. Consequently, we present implications for designing notifications for mobile and wearable devices. Proceedings of the 2017 CHI Conference on Human Factors in Computing Systems, pp. 5114–5119, ACM, Denver, Colorado, USA, 2017, ISBN: 978-1-4503-4655-9. Obtaining information about audience engagement in presentations is a valuable asset for presenters in many domains. Prior literature mostly utilized explicit methods of collecting feedback which induce distractions, add workload on audience and do not provide objective information to presenters. We present EngageMeter - a system that allows fine-grained information on audience engagement to be obtained implicitly from multiple brain-computer interfaces (BCI) and to be fed back to presenters for real time and post-hoc access. Through evaluation during an HCI conference (Naudience=11, Npresenters=3) we found that EngageMeter provides value to presenters (a) in real-time, since it allows reacting to current engagement scores by changing tone or adding pauses, and (b) in post-hoc, since presenters can adjust their slides and embed extra elements. We discuss how EngageMeter can be used in collocated and distributed audience sensing as well as how it can aid presenters in long term use. Proceedings of the 2017 CHI Conference Extended Abstracts on Human Factors in Computing Systems, pp. 668–673, ACM, Denver, Colorado, USA, 2017, ISBN: 978-1-4503-4656-6. Technical capabilities increase steadily while human evolution is slow. Technical sensors improve while human senses remain largely the same. Many tasks are becoming much easier when our perception is augmented with additional information. 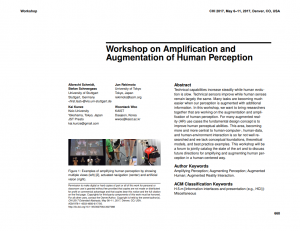 In this workshop, we want to bring researchers together that are working on the augmentation and amplification of human perception. For many augmented reality (AR) use cases the fundamental design concept is to improve human perceptual abilities. This area, becoming more and more central to human-computer-, human-data, and human-environment interaction is so far not well researched and we lack conceptual foundations, theoretical models, and best practice examples. This workshop will be a forum to jointly catalog the state of the art and to discuss future directions for amplifying and augmenting human perception in a human centered way. Proceedings of the 2017 CHI Conference on Human Factors in Computing Systems, pp. 6133–6146, ACM, Denver, Colorado, USA, 2017, ISBN: 978-1-4503-4655-9. Proceedings of the 2017 ACM International Joint Conference on Pervasive and Ubiquitous Computing and Proceedings of the 2017 ACM International Symposium on Wearable Computers, pp. 662–665, ACM, Maui, Hawaii, 2017, ISBN: 978-1-4503-5190-4. A recurring science fiction theme is the downloading of abilities from another human to one's own mind. Emerging technologies beyond simple audio/video recordings such as: 360° videos, tactile recorders and odor recorders are promising tools to enable skill transfer and empathy. However, the produced large datasets require new means for selecting, displaying and sharing experiences. This workshop will bring together researchers from a wide range of computing disciplines, such as virtual reality, mobile computing, privacy and security, social computing and ethnography, usability, and systems research. Furthermore, we will invite researchers from related disciplines such as psychology and economics. The objective is to discuss how these trends are changing our existing research on sharing experiences and knowledge to augment the human mind. Proceedings of the 2017 ACM Conference Companion Publication on Designing Interactive Systems, pp. 192–196, ACM, Edinburgh, United Kingdom, 2017, ISBN: 978-1-4503-4991-8. While amateur running is one of the most popular recreational sport activities, it also produces many injuries, which are often caused by improper technique or shoe choice. 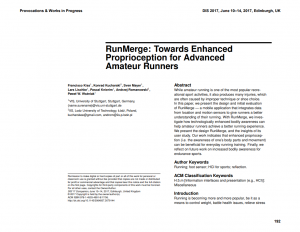 In this paper, we present the design and initial evaluation of RunMerge - a mobile application that integrates data from location and motion sensors to give runners a better understanding of their running. With RunMerge, we investigate how technologically enhanced bodily awareness can help amateur runners achieve a better running experience. We present the design RunMerge, and the insights of its user study. Our work indicates that enhanced proprioception (i.e. the awareness of one's body parts and movement) can be beneficial for everyday running training. Finally, we reflect on future work on increased bodily awareness for endurance sports. Proceedings of the 2017 CHI Conference on Human Factors in Computing Systems, pp. 2998–3010, ACM 2017. We are often confronted with information interfaces designed in an unfamiliar language, especially in an increasingly globalized world, where the language barrier inhibits interaction with the system. In our work, we explore the design space for building interfaces that can detect the user's language proficiency. Specifically, we look at how a user's gaze properties can be used to detect whether the interface is presented in a language they understand. We report a study (N=21) where participants were presented with questions in multiple languages, whilst being recorded for gaze behavior. We identified fixation and blink durations to be effective indicators of the participants' language proficiencies. 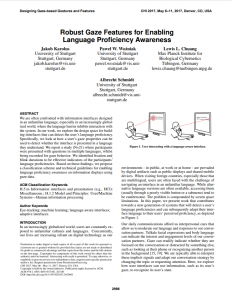 Based on these findings, we propose a classification scheme and technical guidelines for enabling language proficiency awareness on information displays using gaze data. Proceedings of the 2017 CHI Conference on Human Factors in Computing Systems, pp. 3751–3763, ACM, Denver, Colorado, USA, 2017, ISBN: 978-1-4503-4655-9.